In his recent Forbes article on companies that are seizing the opportunities of digital transformation, analyst Daniel Newman compared this revolution to “a charging digital bullet train.” This is one of the best metaphors I’ve heard to emphasize what “going digital” feels like to most companies these days. If enabling this type of digital experience is not an inherent part of one’s business strategy, the sound of that racing bullet train is probably unsettling. At Schneider, though, that sound signals an exciting opportunity for a digital journey to new and thrilling places. Do you want the digital world to thrive without you? Over the past 25 years at Schneider Electric, I had a long stretch in Finance and M&A before starting our global IT organization. Why is this relevant? 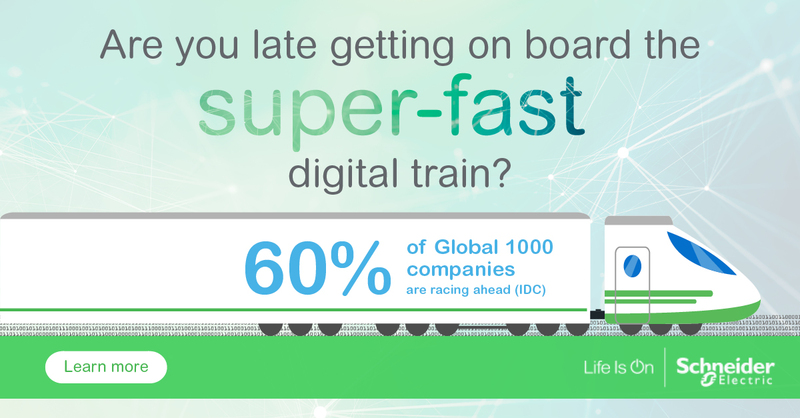 Well, having looked at more business cases than I care to remember, I’m going to say that the digital bullet train is also the new revenue stream of tomorrow, even though the return on investment might look elusive today, and be hard to capture with traditional tools. In other words, transforming the core — though much more unsettling and difficult — would be a better bet for many companies than just experimenting on the edges. Unbundle your core business … or somebody will do it for you. The business outcomes are worth it. Connected products and business model innovations at the manufacturing firm level, for example, could yield a 25% revenue increase. The Internet of Things (IoT) is your golden ticket. We see IoT, and fast-escalating artificial intelligence technologies, as the golden ticket for a successful transformation. Our IoT ticket is EcoStruxure™ — an interoperable IoT architecture and platform that helps you scale your digital transformation with connected products; edge control for critical operations onsite; and apps, analytics, and digital services. With EcoStruxure, you can quickly pivot from just accumulating copious amounts of data to gaining deeper business knowledge that enables better decision making. For smart power distribution, we’ve embedded intelligence in circuit breakers. We’ve connected our long-standing Altivar variable speed drive so operators can monitor risk and predict failure far before it happens. And, we leveraged the cloud to monitor data center infrastructure remotely and send filtered notifications to smartphones as needed. We see digital services as an exciting new frontier for Schneider. And we didn’t have to rip and replace our core business to seize the value. Instead, we enhanced our best-in-class offers and re-architected our end users’ experience to drive new and positive business outcomes for our customers. We want to help you thrive in the digital economy. Watch our keynote session “IoT Co-Innovation: Powering the Digital Transformation,” with Cyril Perducat, our IoT & Digital Transformation Executive Vice President from our Innovation Summit in Hong Kong. We can help you embark on your digital journey so you can succeed at every milepost along the way, improving energy efficiency and business sustainability. what is Schneider doing in the energy management of wireless devices connected to IoT ecosystem ? Would like to know .